Steven "Steve" Haines is a character in the HD Universe appearing as a main character and one of the two main antagonists in Grand Theft Auto V. Haines is a decorated and corrupt FIB agent. He is voiced by Robert Bogue. Steve Haines, by 2013, had become a highly decorated FIB agent and the host of The Underbelly of Paradise television show reporting on gang and other criminal activity within Los Santos. Haines, behind his reputation, had become a corrupt FIB agent and had begun breaking the law in an attempt advance his career. He and Andreas Sanchez had been partnered up and began working against the IAA to obtain more government funding after cuts to the budgets of both organisations. He and Sanchez begin to use their influence over fellow agent Dave Norton to use Michael De Santa, who also involves Trevor Philips and Franklin Clinton, to carry out their corrupt activity. The three first kidnap an IAA informant with information about an Azerbaijani terror suspect who is later killed by Michael after Haines instructs Trevor to torture the informant. Haines tells Trevor to kill the informant although he takes the informant to Los Santos International Airport. The conflict with the IAA for government funding intensifies when Haines has the three steal an Securicar full of IAA money. Haines and Norton, however, order the three to obtain the necessary items to infiltrate the Humane Labs and Research facility to steal a powerful neurotoxin, which the IAA plans to sell to a terrorist organisation to have the gas released over a major metropolitan area in order to increase the IAA's funding. A bank robbery gives the team the funds to retrieve the nerve gas, which is reported in the media to be a cheap perfume. Haines and Norton also have Michael, Franklin and two accomplices perform a terrorist attack on the FIB Building in order to retrieve compromising information about Haines and Norton. During the events performed by Michael, Trevor and Franklin suspicion begins to fall on Haines and Norton. Norton, at the request of Haines, arranges to meet Michael one last time. Haines, however, was to use the meeting as an attempt to arrest both Norton and Michael to deflect attention away from his own involvement. The meeting, which also involves Andreas Sanchez, is interupted by other FIB agents with Sanchez revealing he had been working undercover. During a stand off Haines is shot in the leg and, in retaliation, shoots and kills Sanchez. Haines escapes despite the involvement of the FIB, IAA and Merryweather teams becoming involved and his injured leg. Haines, following the betrayal, decides to kill Michael, Franklin and Trevor but is convinced by Norton to spare both Michael and Franklin. He insists, however, on the death of Trevor communicating this mission with Franklin, who is asked by Devin Weston to kill Michael. The player then has three choices: to follow Haines' orders to kill Trevor, to kill Michael on behalf of Weston or to save both. If the player decides to save both Michael and Trevor, the three team up one last time in order to kill their enemies: Haines, Weston, Wei Cheng and Stretch. Lester Crest finds Haines at the Del Perro Pier, filming his TV show. Trevor decides that he will assassinate Haines since he never liked him from the moment they first met. Trevor finds Haines on the Ferris wheel with a cameraman, and Trevor snipes Haines, killing him. 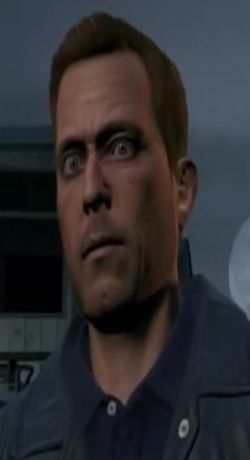 Agent Haines bears many similarities to LSPD Officer Frank Tenpenny, the main antagonist of Grand Theft Auto: San Andreas. Both Haines and Tenpenny are corrupt law enforcement officials who use their position to force the protagonist(s) to commit crimes on their behalf to further their own careers. However, unlike Tenpenny, Haines can get away with his crimes if the player chooses to assassinate either Michael or Trevor.